Planning your first trip to Boston? Or want to see it from a new perspective? 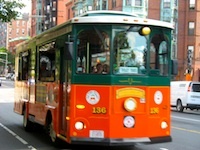 Boston sightseeing tours give you the perfect way to experience the city. Of course you'll visit historical landmarks along the Freedom Trail, famous museums and churches, American Revolution monuments and modern skyscrapers, and Boston Harbor. You may even get to see Fenway Park. But to enhance your experience, you'll also hear interesting facts, tales, and legends about the city from the entertaining tour guides. Take a look at the sightseeing tours listed below - you’ll see a great selection of short tours, plus even a day-long adventure! And don’t miss Boston Discovery Guide's recommendation for a self-guided tour. Boston Insider Tip: Most Boston sightseeing tours have limited space and fill up quickly - so to avoid disappointment, book your tour the easy way before you travel - book online! 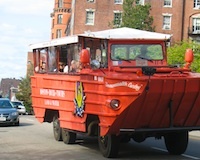 Nothing is more fun than a Duck Tour - plus it's a fun sightseeing experience. These huge amphibious vehicles place you high above everyone else, giving you a perfect view as you roll by famous Freedom Trail sites, stately Beacon Hill mansions, trendy Newbury Street boutiques, Faneuil Hall, Boston Common, plus more...and then you splash down into the Charles River for a leisurely cruise past unique views of Boston and Cambridge. Tour trolleys let you sightsee and explore at your own pace. Stay on the trolley for the entire loop - almost 2 hours - as the conductor points out iconic Boston and Cambridge sites along the way. Or, hop off at whichever stops you choose, explore on your own - then hop back on. 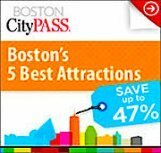 As a bonus, look for free "extras" along with your tour ticket - a second day on the trolleys, a Boston Harbor cruise, a free museum pass, discount coupons to other attractions. Stops at Black Falcon Cruise Ship Terminal on Port of Call days. Sightseeing passes give you BIG savings on trolley tours, whale watching, Harbor cruises, and duck boat tours - they're the easiest way to save on tours. You'll shudder, you'll shiver, and you'll see Boston in a new way as the talented cast of characters-tour guides shows you the darker side of the city. Tales of murder, mayhem, treachery, and even molasses come alive as you tour by trolley and on foot to our oldest graveyards, its most haunted hotel, and even Jack the Ripper's haunts. Expect to hear loud sounds, learn shocking details about the city's grisly past, and believe it or not, have loads of fun! 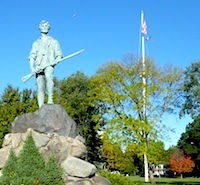 Lexington and Concord, made famous by Paul Revere's ride and the first battles of the American Revolution, lie just outside of Boston. To see these special historic places as well as Boston's most important sights, join the Total Boston Experience Tour. After a luxury motorcoach picks you up at your hotel, you get to sit back and relax as the expert tour guide describes each famous site along the way. 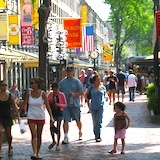 Enjoy lunch or shopping on your own in Cambridge's Harvard Square - and then return to Boston and wrap up the afternoon with a special Boston tour of famous historic and modern landmarks. If you just want to see Cambridge, Lexington, and Concord, you can book a shorter version of this tour. It lasts about 3 hours and 30 minutes. You'll visit Harvard Yard, the oldest part of Harvard University, as well as the most famous historic sites in Lexington and Concord. Perfect way to see bustling Harvard Square, plus the beautiful scenic New England countryside. 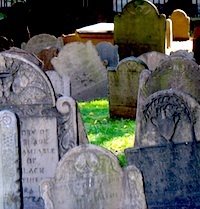 Think a Freedom Trail tour involves a lot of dull history? Think again! 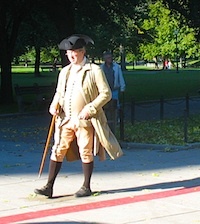 Your authentically dressed guide entertain you with tales about Revolutionary Boston as you stroll along the red stripe marking the 2.5 mile Freedom Trail. You'll almost hear the rowdy crowds defying the Redcoats, Sons of Patriots holding secret meetings in our local taverns, and rebel-heroes plotting the path to American freedom. As you walk along the Trail, you'll see Boston Common, old graveyards, historic meeting houses (now museums), Faneuil Hall, and other iconic sites - plus, you're right in the heart of Boston, so you'll see the waterfront and lots of restaurants and boutiques to visit later. 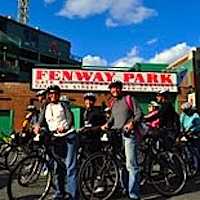 During this fun tour on wheels, your guide leads you along the Freedom Trail, out to see Fenway Park, through Boston Common, and past the elegant Victorian mansions in Back Bay. You'll glide along the Greenway and pass tantalizing cafes in narrow lanes in the Italian North End. Although this tour lasts 3+ hours, your experienced guide sets a comfortable pace. You get a helmet, water, and of course a bike; ask for child seats and trailers in advance if you need them. Book this tour as far ahead as possible - each tour is limited to 6 riders, and they fill up quickly! 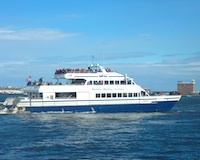 Boston's most famous Revolutionary War confrontations took place not on land but in the Harbor, and this fascinating Boston Harbor sightseeing tour shows you historic and modern landmarks from the water - along with America's oldest continuously manned lighthouse, plenty of picturesque islands, and gorgeous views of the Boston skyline. You'll see a lot during this affordable historic cruise, and its 90-minute length makes it a perfect choice if you have limited time. 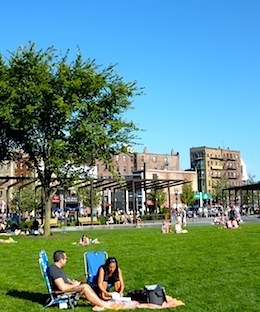 To see a swath of the best of Boston, with many inviting detours beckoning to you along the way, head over to the Rose Kennedy Greenway, a gorgeous ribbon-like park stretching from the North End down to Chinatown. The Greenway runs parallel to the waterfront. Sample delicious food in the North End and Chinatown, explore wharfs and scenic views along the Harbor, and detour into Faneuil Hall Marketplace. Or simply enjoy the Greenway's own attractions - a seasonal carousel, the best splashing fountain in town, numerous places to sit, and a panorama of gardens, trees, and grassy expanses. Fenway Park Tour - A MUST for baseball fans!